 Industrial Vacuum designs and manufactures high quality systems designed for a variety of industries – such as painting & sandblasting, asbestos abatement, roofing applications, abrasive blast recovery, and waste removal.  Their versatility allows them to work with their clients at every stage – from brand new vacuum systems to updating parts and accessories. 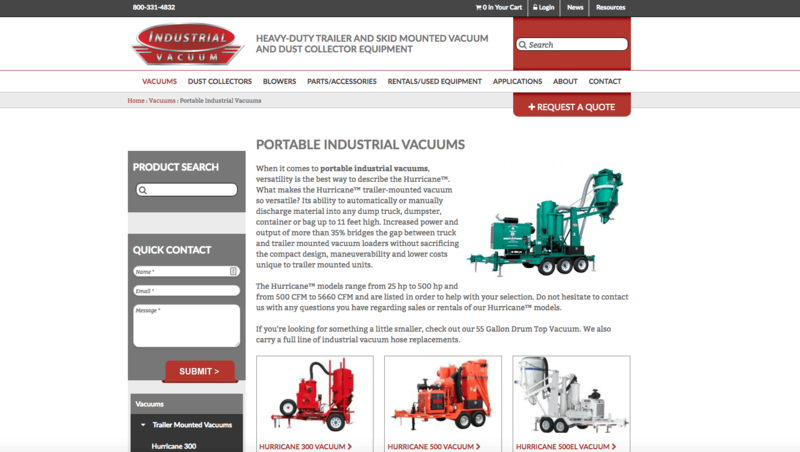 Industrial Vacuum is an long-time client of ours. We have built multiple websites for them over our years together and also developed and continue to manager their search marketing campaigns (SEO & PPC) – all of which have been greatly successful. During one of our quarterly strategy review meeting with the client, our team brought up keyword trend data that they identified about an upcoming regulation that would be effecting the industry. OSHA was updating its regulations on industrial silica dust exposure – and Industrial Vacuum provided the solution for companies to compliance. Knowing companies would have difficulty complying with these stricter regulations and there would also be a greater demand for industrial vacuums to meet the new OSHA standard, our team developed a strategy to educate the market. 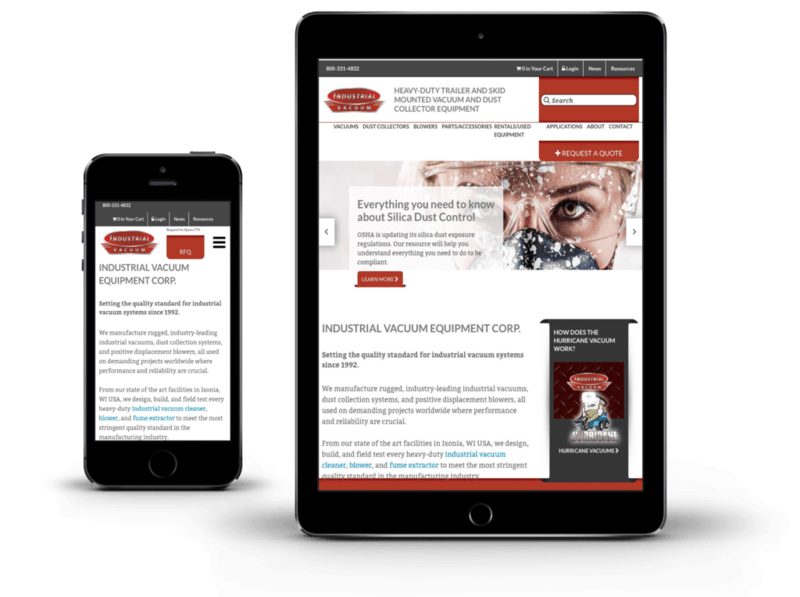 After extensively researching the new OSHA regulations and reading through news articles and industry forums, our team identified an educational element would be needed across all stages of the buying cycle – from awareness to purchase – to truly educate and help industries through compliance.  But first, we need to get users to the site by targeting those in the hydraulic fracking and general construction industry looking to learn about the new silica rules. Thus, we strategizes a landing page as a starting point for our target audience that would include everything they needed to know and guide them them through the process. 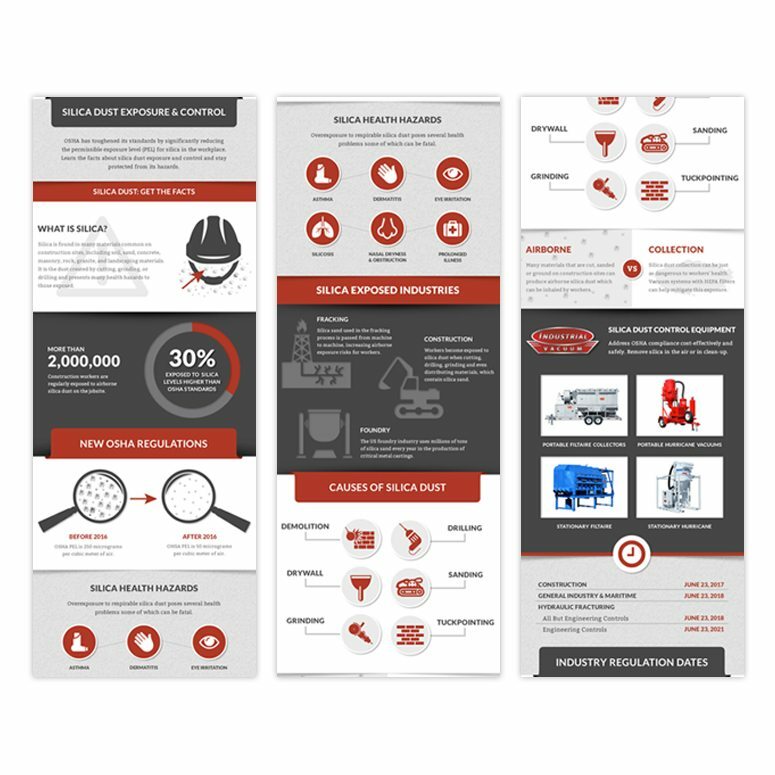 We created content that included basic facts about the regulations, infographics to easily explain silica in a visually friendly way, downloadable posters to hang in the workplace, and the types of machines needed for each industry and application. Once the new landing page was built, our marketing teams went to work optimizing and promoting the content to get in front of our target audience. 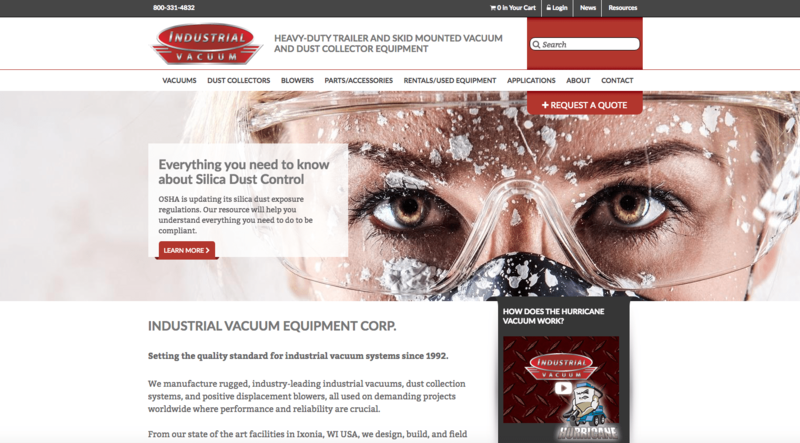 Since launch in mid-October of 2016, their silica dust control page has become Industrial Vacuum’s second highest landing page next to their homepage. Their old silica dust page only had 261 total visits and which didn’t have any conversion. 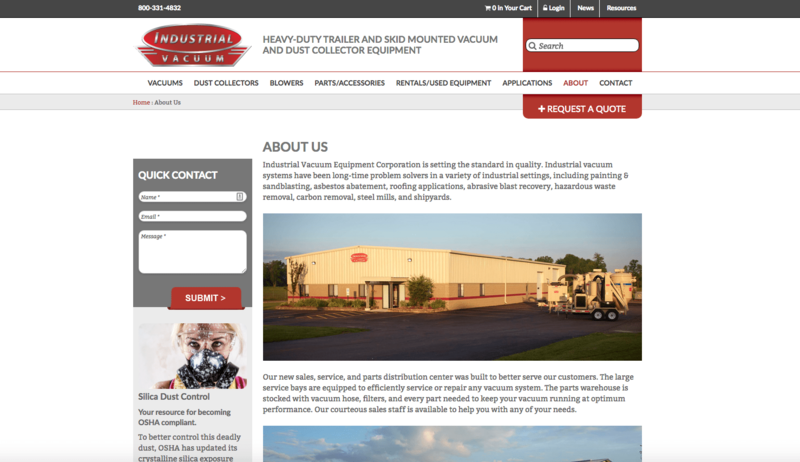 The new page is one of Industrial Vacuums top 20 converting pages. The biggest success was our ability to outrank OSHA in organic results. 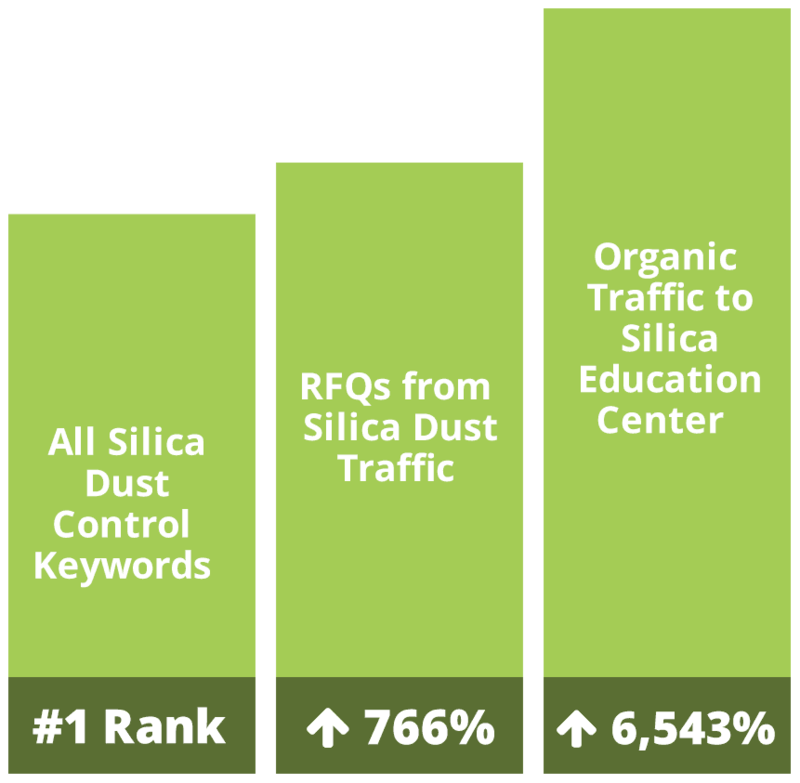 If you do any searches results to silica dust control, you will find Industrial Vacuum in the #1 spot. The program continues to expand as we focus on building content and promotions specific to each industry as the regulation deadlines approach.  We utilize an integrated digital marketing strategy including email, SEO, social media, content development and design, paid search, display advertising, and remarketing to ensure success and elevate results. The campaign has been very successful. We are busier than we have ever been. The guys aren’t out there selling, because they’re too busy just taking orders as they come in. 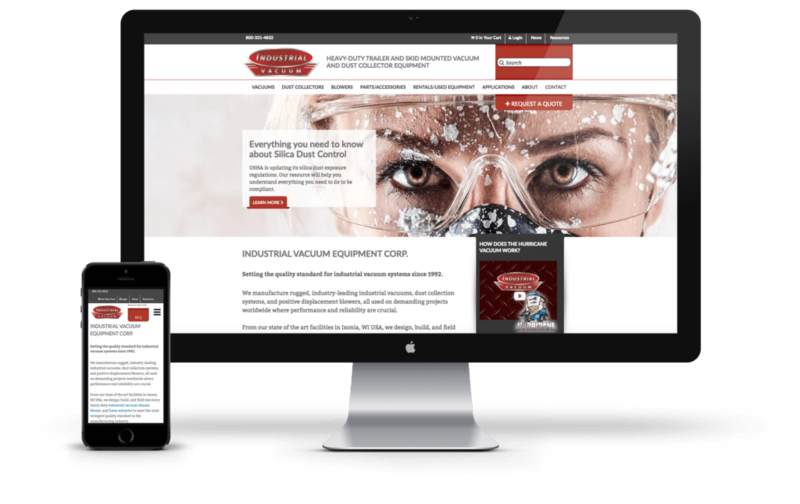 Top Floor created a series of landing pages to branch off Industrial Vacuum’s original Silica Dust Control application page. Each piece would speak to a different stage of the buying cycle – education of the silica dust exposure and product solutions, aka “Equipment You Need”. 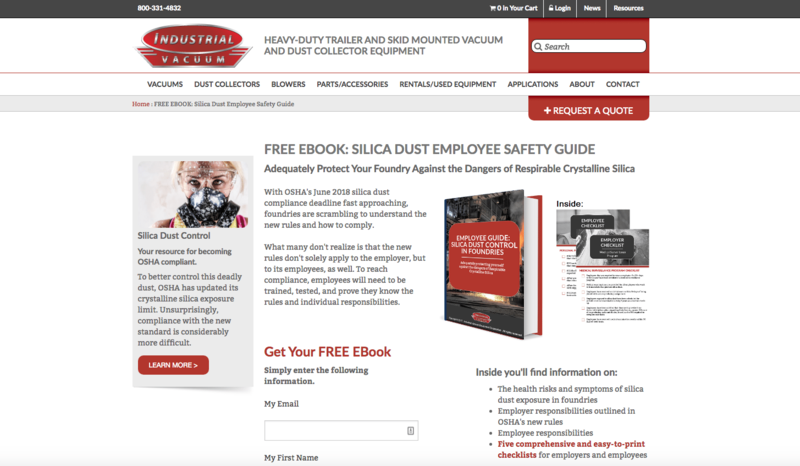 Their Silica Dust application page turned into a resource hub of important facts surrounding the regulations, and what was needed to comply, including a “10 Quick Facts” list, “The Three Machines You Need to be OSHA Compliant” and even a guide to training staff on OSHA compliance – just to name a few. The variety of content was strategically positioned within the overall design of the page in order to position the read to go from learning the basics, to the first steps towards making a purchase. By incorporating educational material around silica dust all in one place – it educated their potential buyers on what they needed to do to comply and also let them know that their concerns for meeting regulations were both recognized and addressed – leading to overall brand trust. With one of the first deadlines approaching for the foundry industry, we rolled out a foundry specific campaign. 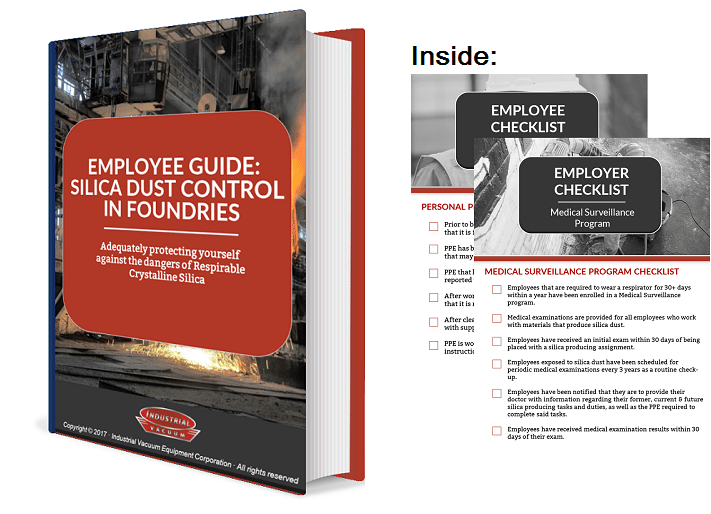 This campaign was built around an e-book “Employee Guide: Silica Dust Control In Foundries” which was promoted to industry related website, emails, and social platforms targeting the decision makers in the foundry industries for these compliance regulations. 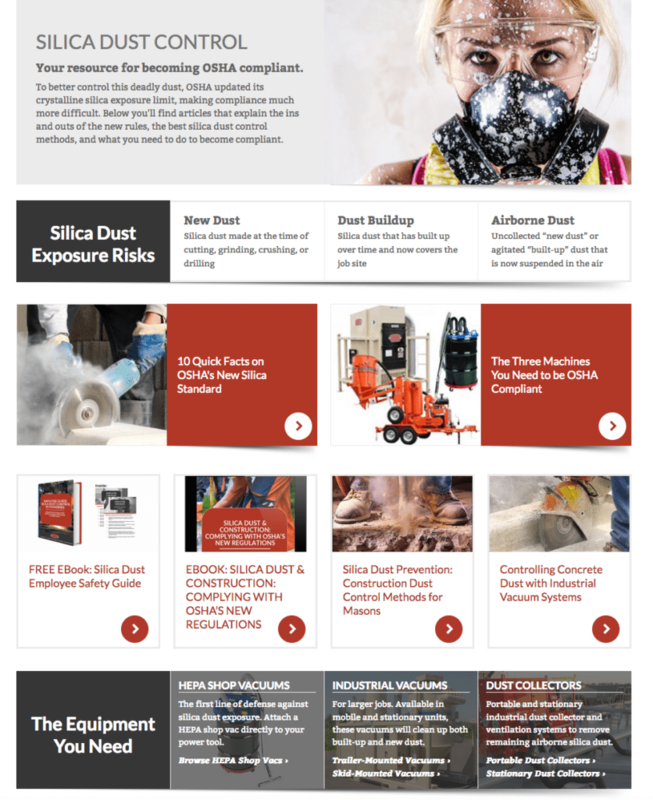 The purpose of this infographic was to condense the robust amount of information about silica dust, the potential health risks associated, and new OSHA regulations into a simplified format. This graphic communicates the harmful exposure silica dust can cause. 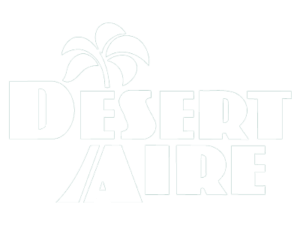 Most importantly, it advertises the machinery Industrial Vacuum developed specifically for the control and cleanup of silica dust. This graphic could then be shared on social media with hopes to redirect concerned consumers to Industrial Vacuum’s site. 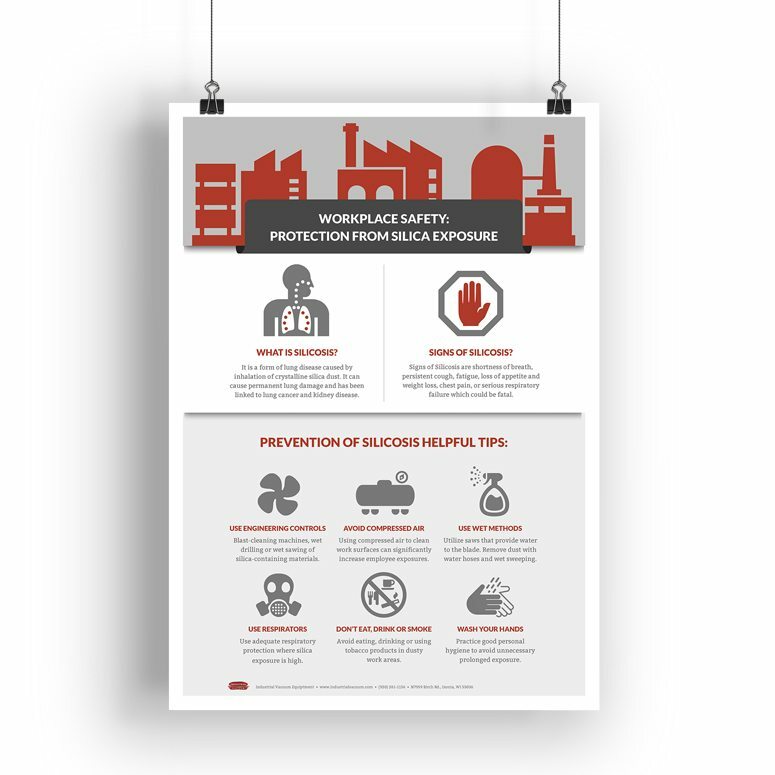 Top Floor designed this infographic with the intention of it being downloaded and displayed in workplaces where silica dust could be a hazard to employees. The graphic features large icons to create visual interest, as well as break down the information, to entice people to take the necessary precautions. This is a particularly versatile piece because it has the potential to be displayed in many businesses, which in turn increases brand awareness for Industrial Vacuum as a solution to silica dust control.